I've been wanting to completely renovate and reseed my lawn for a long time and I think either this year or next year I finally will. 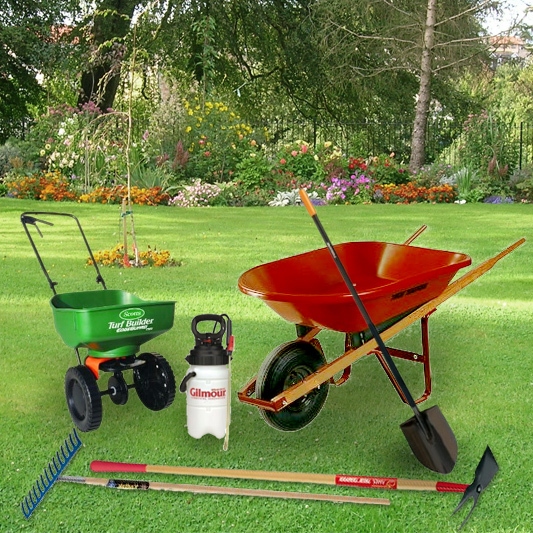 While coming up with my lawn renovation plan I tried to come up with a list of tools that would be required to make the lawn renovation easier. Lawn renovation doesn't require a lot of tools and I have most of them but there are a few that I will need to purchase. The first step in renovating a lawn is killing the existing grass and weeds. The easiest way to accomplish this is to use a glyphosate based herbicide like Roundup or one of the organic weed and grass killers. A pump sprayer is the best way to apply this herbicide because it gives control over the application rate and helps you prevent overspray. I had a nice Craftsman metal pump sprayer but I can't seem to find it anymore. I'm considering getting the Smith 2-Gallon Max Contractor Sprayer because it has very good reviews, is heavy duty and comes with a shoulder strap which will make it easy to use. It's great that it comes with the shoulder strap because that allows you to have one hand free to carry a large piece of cardboard to shield other plants from overspray when you're killing the lawn around the edges. If you have a larger area to cover you might want to consider a 4 Gallon Backpack Sprayer . You wear it on your back and there's a lever on one side that is used to add pressure to the system. Or you can use a small pump sprayer for the edges and an Ortho Dial 'N Spray Hose-End Sprayer to cover the center area away from plants, trees and shrubs you don't want to harm. These sprayers are useful to have to apply different amendments to your lawn throughout the year. Some of the organic amendments I use contain live bacteria and fungi and using a pump sprayer allows me to dechlorinate the water before spraying. Using the Dial 'N Spray chlorinated city water would mix with the amendment and greatly reduce the effects. Have high and low spots in my lawn which causes me to have a bumpy lawn. This makes it a pain to mow. When I do my renovation I plan on evening out those areas. There are special rakes used to do this. Professional landscape contractors use something like this Truper Tru Pro 36-Inch Aluminum Landscape Rake . It has a wide 36" rake head which makes it easy to level a large area. Not as wide but I believe sturdier is this Ames True Temper Kodiak Forged Level Head Rake . The rake head is 14" wide which is nice for smaller areas. The head of the rake is one solid piece of forged steel which makes it more durable than some other rakes that are welded or riveted together. If you're spreading compost a leveling rake will be more useful than a flexible leaf rake. A round point shovel is useful if you have to do any digging and to help move material such as topsoil, compost and mulch. I'm becoming more partial to Fiskars tools, their Long Handle Digging Shovel looks nice. I have an old wood handled shovel that works fine. If that ever goes I'll likely get the Fiskars. A garden spade is a square tipped shovel that is also good for moving material and great for creating edges around beds and transplanting. It's also nice to have a long handled shovel as well as a D-handeled shovel. If you don't mind spending a little more the Ames True Temper Pony Garden Spade is one of the best garden spades I've seen. A good garden spade is something you'll wind up using often but if you want to save a little money Fiskars 9667 Garden Spade is a good second choice. I used to use a garden spade along with a mattock/cultivator on a long handle to create the edges between lawn and garden beds but I'm considering getting a heavier mattock/pick combination like the Ames True Temper Pick Mattock with 36-Inch FiberPro Handle if I need to do any bigger digging. When I do my renovation I'm going to need a bit of topsoil to level out some areas and if I topdress with compost I'll need away to move that around too. I didn't realize wheelbarrows were so expensive. The cheapest one I found online was Ames True Temper 4 Cubic Foot Steel Homeowner Wheelbarrow. I saw some cheaper ones locally but I have concerns about the durability. This is a bulky tool that takes up a lot of space and I'll probably never need again I might rent one so I get something durable. Unfortunately I don't know anyone that I can borrow one from. Finally a spreader will be needed to spread the grass seed. I have an older Scotts Accugreen drop spreader because I don't have a huge lawn and have to deal with some odd angles. The new Scotts Drop Spreader doesn't seem to have many great reviews. If you have a larger area to cover the Scotts 76121 Turf Builder EdgeGuard Mini Broadcast Spreader was my second choice. A broadcast spreader spreads seed or fertilizer over a larger area than a drop spreader which makes things go quicker. The edge guard blocks the spray on one side so you don't get grass seeds in your garden beds or walkways. Most homeowners will have all or at least most of the above products if they do any gardening themselves. If you don't, the cost of a lawn renovation can be quite high but all these tools are going to be useful in maintaining your landscape and a lot cheaper than hiring someone to do the work and maintaining your home's lawn and garden.